You are brilliant Lilianne ! Most kind of you, Greg! Thank you, Jess. Feedback is so important – lets one know if one is headed in the right direction! Lilian -i love what u did with all those “left overs” , love your work always. Thanks Hagar – You are right about ‘left overs’. I do some of my most creative work with what I find lying about and I know that you work in a similar way. Happy summer! 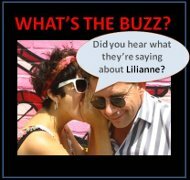 Lilianne says and proves it, so it IS! Folks: Summer is official open for… our pleasure. Thanks for the colorful and winning declaration, dear Lilianne.